I'm ready to finish Red Thief, but the characters, not so much. It's moving more slowly than I like, but only have so much time to work on the story. Trying to make sure each scene advances the next. Some days are a bit frustrating and it is like pulling teeth to get the words down on the page. Other days it flows like smooth wine and just can't get enough. Hmm! A nice smooth St. Emilion Bordeaux sounds good just about now. 1) Write every morning for half an hour and complete at least one full page front and page. 2) Continue with morning pages. 5) Decide O theme for 52 books in 52 weeks. Continuing discussion on National Poetry Month. Speaking of poetry. I leave you with couple Haiku. How about a mini writing challenge since it is National Poetry Month. 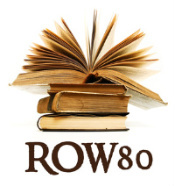 Write a Haiku about ROW80, your writing or whatever you are feeling today. "But, later, coming back and reading what I have produced, I am unable to detect the difference between what came easily and when I had to sit down and say, 'Well, now it's writing time and now I'll write.' There's no difference on paper between the two." Keep on, even when it's like pulling teeth! Keep writing. You'll get past that point at which you got stuck. And yes, I want a gazebo like that, too. Wow. That's cool. If it could be square in the middle of the Boy Scout camp I love so much (complete with plumbing, however), that'd be even better. 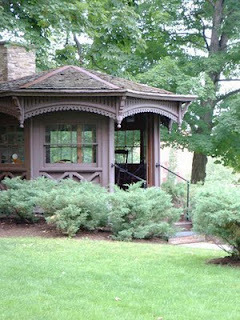 That reading hut is fabulous. I could so imagine myself in one of those! @Katen - what a wonderful quote. Will have to write that one down. So true! @Rebecca - thanks. Just getting the words down is enough for me. @Susan - I think I found the sticking point. @Staci - yep, it's very cool.